There’s some astonishing news on the breast cancer front. A study published on-line this week in The Journal of Clinical Oncology (JCO) suggests that regular, low-dose aspirin use reduces the risk of recurrence and death from breast cancer among women who’ve had stage I, II or III (non-metastatic) disease. 3. The cost: aspirin is widely available, without patent restriction. Aspirin costs around $5 for 100 tablets, several months’ supply. Aspirin is an old and generally safe drug, available over the counter, that can be very dangerous in people with have bleeding problems or low platelets (blood clotting cells). Among women with breast cancer who are actively undergoing chemotherapy, radiation and some other treatments, aspirin use can exacerbate bleeding problems and may be inadvisable. Anyone who considers taking aspirin should discuss, first, with their doctor if it’s OK. 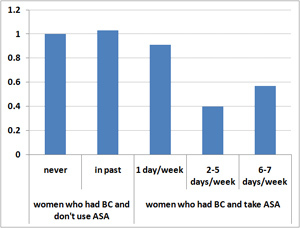 The study participants reported taking aspirin (acetylsalicylic acid, or ASA in medical parlance) at varying doses and for a variety of reasons. More than a third of the breast cancer survivors used aspirin for heart disease. 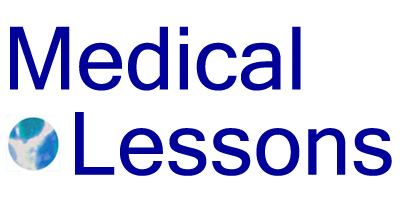 In that scenario, the typical dose is a baby aspirin (81 milligrams) on most days. Other women reported they took the drug for muscle and joint pains, backaches, headaches and other reasons. The work derives from the Nurses’ Health Study, a three-decades-and-going-strong observational analysis of health among over 238,000 registered nurses. These graphs represent data from “Aspirin Intake and Survival After Breast Cancer,” JCO, Holmes, et al, published on-line 2/16/10. The data are listed in Tables 2 and 3 of the paper, multivariate analysis, with 1.0 as the relative risk for women who had breast cancer and do not take aspirin (ASA). Aspirin Use, Relative Risk of BC Recurrence. 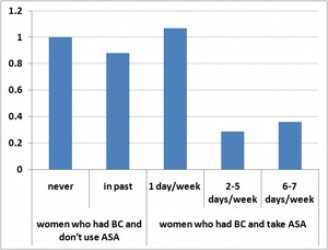 Among BC survivors who reported taking aspirin between 2 and 5 days per week, the chances of dying from breast cancer were 29 percent relative to the baseline (no ASA) group and the odds of BC recurring, 40 percent. In other words, aspirin use was associated with a 71 percent decline in deaths from breast cancer and a 60 percent drop in the recurrence rate for these women. For those who ingested aspirin 6 or 7 days per week, the effects were similar: the death rate from cancer was 36 percent and the recurrence rate 57 percent, both significantly reduced in comparison to women who didn’t use aspirin. Among survivors who used 0-1 aspirin tablets per week, there was no measurable effect on either breast cancer recurrence or survival. The results applied pretty much across the board – to premenopausal and post-menopausal women, to those with Stage I, II, and to a lesser extent, Stage III disease and to survivors with estrogen receptor positive (ER+) and negative (ER-) tumors. The findings were not anticipated, according to the investigators, because earlier studies failed to show that aspirin prevents breast cancer from developing in the first place. What’s different here, they speculate, is that aspirin inhibits some inflammatory molecules, like prostaglandins or cyclooxygenases. The authors suggest these enzymes promote growth and metastatic spread of tumors that are already present. The study statistics are sound, with good (low) p-values for the aspirin-use trends, meaning that the likelihood of the observations being due to chance is extremely low. There are some limitations: first that the trial was not randomized, and second, that the reported use of aspirin was based on survey data provided by the nurses. But the size of the study, involving more than 4000 women who had breast cancer, the duration of analysis (over decades) and the not-slight differences in results between the treatment groups speak to the significance and potential implications. *In this analysis, person-years would be defined as the sum, for all women registered in the study, of the years for which they’ve been monitored. For example if 3 women were evaluated, each for 10 years, the study would include 30 person-years of data.